That’s what my friend Alisa always says and I believe her when she says it. I believe all the articles that scientist have discovered that when we smile it sends signals to our brain that good things are happening, whether they really are or not. I believe a smile can change your brain chemistry. But what happens when you’ve lost your smile? March blew in with a big, cold, windy, dust storm and I kinda lost my smile. Right there where you are expecting spring to be, you find only and extended winter and this time the bomb cyclone has knocked out your electricity for three days. So I had to preach it to myself. Countenance counts. Smiling makes a difference. So I hopped in Instagram stories to share this little tidbit of wisdom, because I learned a long time ago that if I need it, so does someone else. And lo and behold, too much coffee to fight off the cold winter and my teeth looked, well, stained and I found myself trying to smile without showing my teeth. Yeah, it was as awkward as it sounds. Now listen, I believe you are beautiful. Not one thing about you or me or anyone else needs fixing or correcting, but if you are frustrated with something you can change, you should change it. Me? I have teeth thing. As far as I know, I’ve always had it. My teeth are porous, and they just turn whatever color I’ve recently consumed, and no amount of scrubbing or dental hygiene takes those marks away. I remember spending lots of money in college buying whitening strips that slipped off my teeth, felt slimy, and often didn’t actually do much. Then I had five kids in four years and started counting my coffee consumption in pots instead of cups. As you can imagine, that didn’t help with the teeth staining. So, I sunk my teeth down into some Smile Brilliant goop (I feel sure that’s not the professional term) and got some trays formed in the exact shape of my teeth. 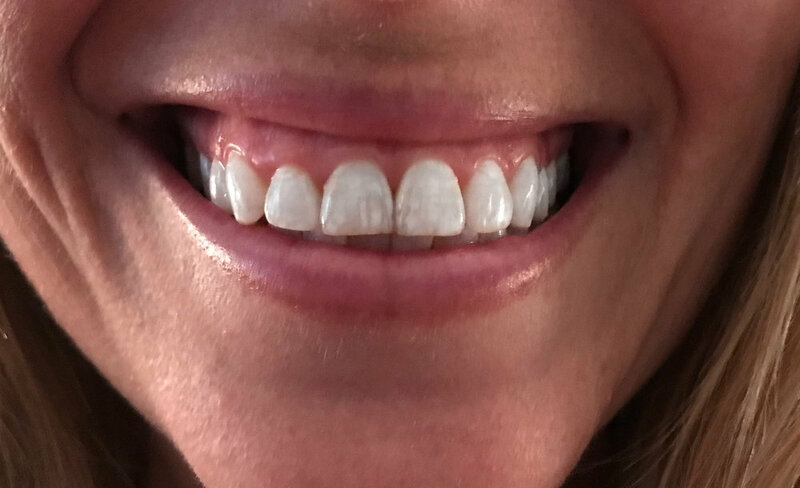 I was a little nervous that the trays my cut into my gums or that the whitening gel might make my teeth sensitivity, but it turns out the trays are super soft and Smile Brilliant provides you with desensitizing gel that is a major help! Each day as soon as I finished breakfast I’d go pop the trays with the whitener in and putter around getting the kids through their school work and laundry done. They’d be out by the time we moved on to our Morning Collective time. I love the results! In just a few days I could see a pretty noticeable difference, by the end of the week I had a shiny, unstained smile back. Because honestly? Life is too short not to smile your brightest, to live to your fullest, to find the joy deep in you and force it to bubble out through a soul deep grin. Sometimes that starts with a feeling and sometimes? It starts by just smiling anyways. Countenance counts after all. Smile Brilliant has agreed to help one of you find your Spring Smile with a whitening system giveaway, and I’m so excited about this because it’s a such a huge value! CLICK HERE TO ENTER THE GIVEAWAY!!!!! I’ll send an email when a winner is chosen! Have a great day and don’t for get to Smile Brilliant!